The explosion of anger from students and young people around the world has shown they are refusing to passively accept the cuts and are refusing to be landed with the bill for the economic mess capitalism is in. 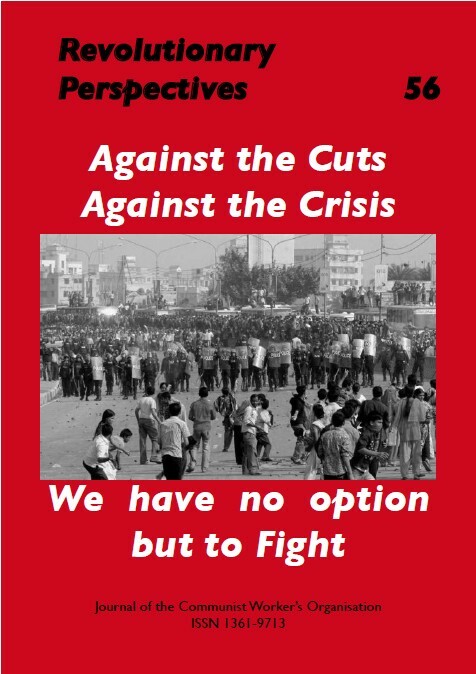 Since the crash student unrest has exploded in Greece, Italy, Ireland, France, the US, Puerto Rico and Germany, but it was the savage cuts in further education announced by the Coalition which led to the unrest in Britain. The announcement that Universities would be able to charge up to £9,000 a year for tuition fees was seen by many as the final nail in the coffin for open access to University education to a whole generation. The Coalition’s actions mean that working class kids wanting to go to University will have to take on even greater crippling debts than before. From next year fees will be paid up front by the Government as a loan and graduates will have to pay them back once their earnings reach £21,000. Originally the interest was to rise every five years but now it’ll go up with inflation. If there’s a recipe for pushing down graduate wages then surely this is it. Less publicized, but every bit as harmful to the attempts of young people to get an education has been the scrapping of EMA, a grant introduced by Labour to help young people from low-income households stay in education after the age of 16. Ever mindful of rising youth unemployment, Labour introduced the EMA to dissuade young people from leaving education and it’s one of the reasons students today represent almost half of the 18-21 population. Some 647,000 16-18 year olds get the grant of up to £30 a week which helps them with the costs of books, course equipment and travel. The abolition of the grant will have a massive impact on poorer students. A National Union of Students survey two years ago of 1,205 EMA recipients in England discovered that 61% wouldn’t be able to carry on with their studies if they lost the grant, and more than half of young people on EMA in Newham told researches the grant helped keep them in education. Young people have been an easy target over the years. Facing low wages and high proportional unemployment, they’ve also borne the brunt of successive welfare cuts to their services and their benefits. As it stands they can’t claim benefits until they reach 18, and even then the amount is derisory. For many further education isn’t a choice, it’s their only option. So when the cuts were announced, unrest quickly followed. 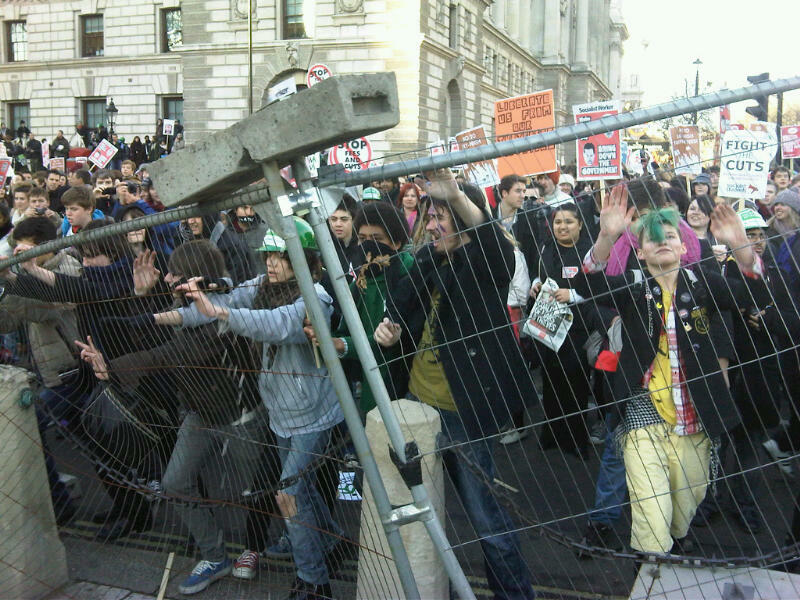 The demo in London on 10th November reached 50,000 people as students and school kids took to the streets. After that demonstrations and sit-ins spread rapidly. The demo in London was followed by further demonstrations and protests in cities like Leeds, Sheffield, Manchester and Liverpool where school kids walked out and joined the protests. Occupations were reported in Sussex, Birmingham, Warwick, Glasgow, Strathclyde, Newcastle, Cardiff, Brighton, Leeds and Sheffield. By the end of November occupations were taking place in at least 20 Universities across the country. The response of the state has been the usual one of condemnation and repression, but there’s no doubt that the bourgeoisie have been rattled by how militant and angry the protesters are. The students pose a real political threat, not just because they represent a whole lost generation that capitalism has nothing to offer but because they can control their own actions be outside the usual confines of the unions or party politics. Many of them have realized it isn’t this or that government to blame for bad policies but the whole system which is bankrupt and which offers a bleak future. The protests also brought many face to face with the forces of the state for the first time. The police use of ‘kettling’ in Whitehall on 24th November meant that kids as young as 12 were trapped behind police lines without access to food or water for five hours while mounted police charged the crowds. In Ireland one protester was beaten unconscious, in London a disabled protester was dragged twice from his wheelchair by riot police. In Newcastle protestors leafleted HSBC bank protesting at the billions used to bail out the banks, chanting: “The banks got bailed out! We got sold out!” Two demonstrators were violently arrested and taken to a local police station where others on the demo marched and called for their release. No doubt these and other protesters (like the ones who surrounded Prince Charles’s car) will be made examples of. If nothing else the viciousness with which the protests were met shows just how thin the veneer of democracy really is. At a time when social inequality is rising, where children on free school meals are 55 times less likely to go to Oxford or Cambridge than those from private schools,(1), the injustices bred by capitalism are harder than ever to ignore. It’s little wonder there’s so much anger when subsidized banks are still paying out obscene bonuses while the working class and it’s children bear the brunt of the cuts. Denying many a university education is just the latest obscenity. In Italy, workers in FIAT Mirafiori factory have called a joint meeting with students to organize a way forward (the document is reproduced below). This is an important step which radically illustrates the difference between the past and the present. In 1968 the workers and students rarely got together especially as most of the students had no class perspective. They were the future managers of capitalist society and relatively privileged. Today as the FIAT document so clearly underlines the attacks on students are attacks on many working class families. Some students in Britain understand the need for solidarity (Manchester students went to show support striking Heinz workers in Wigan, for example) but as in Italy they are still in a minority. Most of the students here are still focused on the issue of education but in France and Italy there seems to be widespread recognition that all sectors of the working class will have to unite. To do that though there has to be a recognition that we are not fighting to alter one bad law or even get rid of one bad politician. The real issue is that capitalism can offer us no real future and that if we want to fight for it we need a wider programme of change. The student movement in Britain will ultimately only succeed if it recognizes this and is linked with the fight of workers elsewhere because as the leaflet from Firenze makes clear it is only the class on which society depends for its functioning that have the power to halt the ruling class – but that means recognizing our collective strength. (1) The Sutton Trust Report 2010.